For as often as I make these No Bake Chocolate Cookies, I’m shocked that I don’t have the recipe on the blog already. I mean, sure I have a nutella version, an espresso flavor, and no bake oatmeal scotchies….but no classic to be found. As my kids are getting older, I’m trying to make sure that they can handle life on their own. You know, do laundry, dishes, and cook for themselves. And while some of my kids are better in the kitchen than others, I have one child (hi Tessa) who no matter what she attempts, it doesn’t work out. 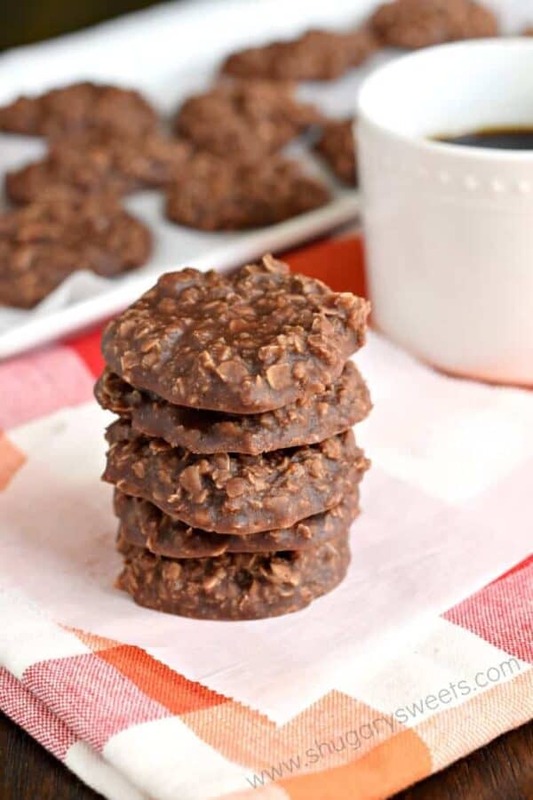 Take these No Bake Chocolate Cookies for example. She burned them. Yes. BURNED them. The first time she attempted to make them on her own, she overcooked the mixture on the stove. Smoke detectors were going off. The burnt smell of chocolate lingered. And there were no cookies to be eaten that day. She can make a mean bowl of Ramen and a spot on PB&J sandwich, so I guess she’s ready for college life one day, haha!! I have a few years to help her master some kitchen skills, and one day she will master these NO BAKE cookies too. Stay tuned! First, have all your ingredients measured and ready. This comes to a boil quickly, and sets up quickly. Also, lay out your parchment paper on your counter before beginning. Next, over medium heat, you’ll combine the sugar, cocoa, milk, and butter. You’ll bring that to a full boil. Boil for only ONE MINUTE. Immediately remove from heat and add in the vanilla, salt, peanut butter, and oats. Stir until combined. Working quickly, drop by large tablespoon onto your parchment paper (I use two spoons). Allow to set, about 20 minutes. Try to not EAT it all as it sets, haha! 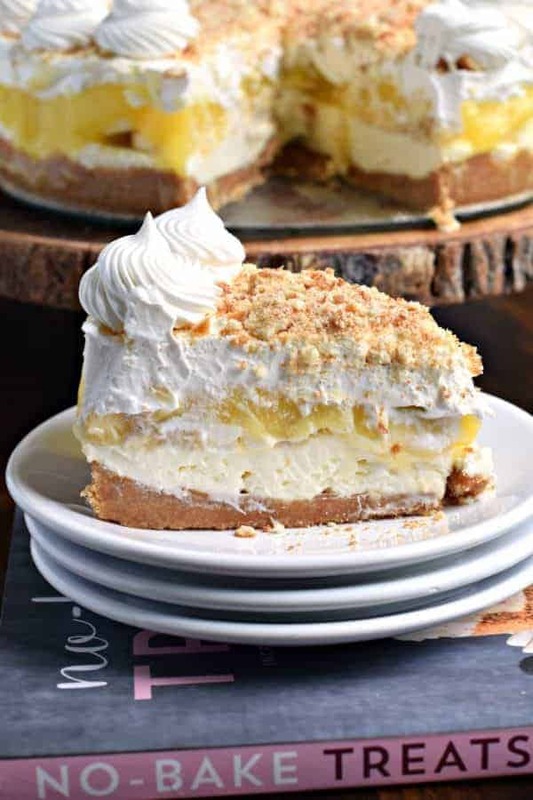 No Bake Banana Cream Cheesecake: one of the best desserts I’ve ever eaten! 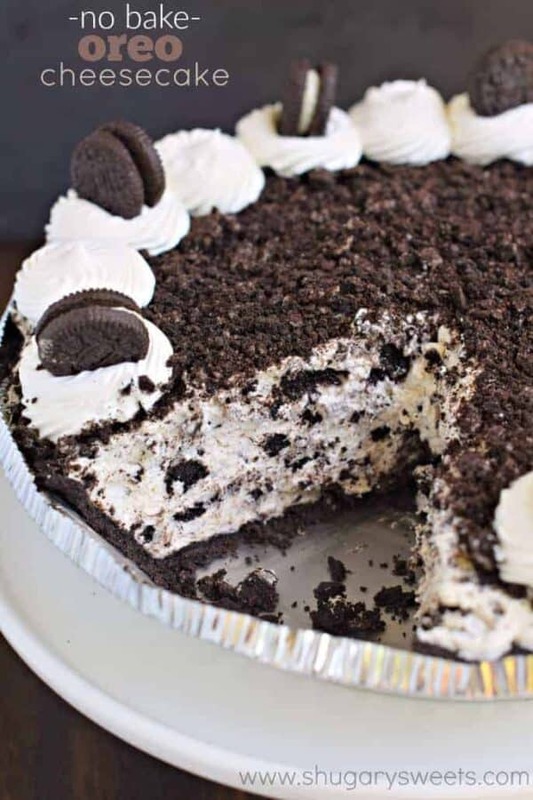 No Bake Oreo Cheesecake: delicious pie that comes together easily! Cookies: No Bake Oatmeal Scotchies: delicious chilled cookies! Easy No Bake Churro Bars with only 3 ingredients. Perfect for any time of year! 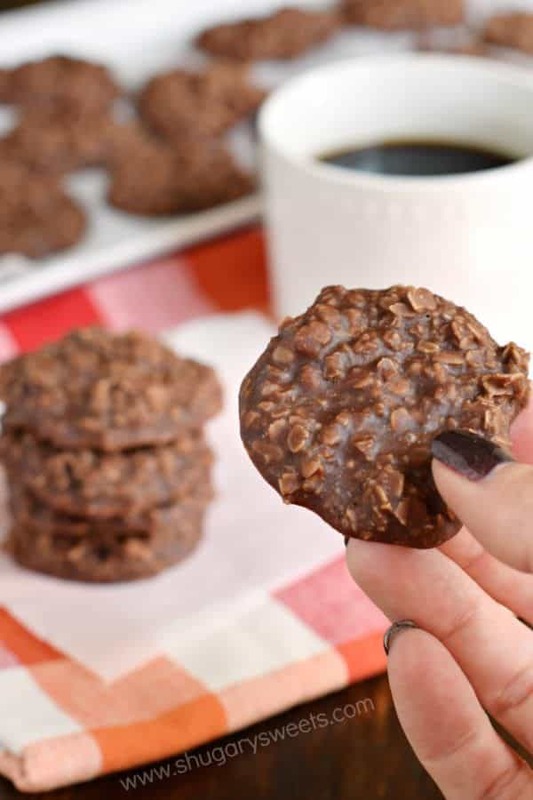 Easy recipe for No Bake Chocolate Cookies! The peanut butter with chocolate and oats gives these cookies so much flavor! Over medium heat, cook sugar, cocoa, milk and butter. Bring to a boil and boil for one minute. Remove from heat. Stir in vanilla, salt, peanut butter, and oats. Stir until combined. Drop by tablespoon on parchment paper and cool. Allow to set about 20 minutes. 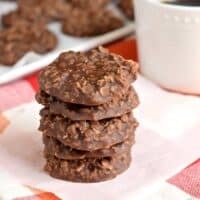 Today’s recipe for No Bake Chocolate Oatmeal Cookies was originally published September 26, 2016 and has been updated and republished in May 2018. I haven’t made this classic in such a long time and they always went over well at get togethers! Funny how when a person starts a blog the automatically think everything has to be made “better” than the original but sometimes a classic just can’t be beat! How many cookies does the No Bake Chocolate Cookies make ? A lot, haha!! These are so hard to count because it really depends on how big of a spoonful. Let’s just go with dozens. I love these cookies! They were the first recipe I learned to make when I was little and the first recipe I memorized. So I have remembered the recipe for over 30 years. I am from a big family and this was one of the treats we made often. I prefer them right from the freezer, but I will take them from the fridge, at room temperature or a hot spoonful straight from the pan. My youngest loves them, but my oldest and husband won’t touch them. More for us. Lol! Love no bake cookies!!! 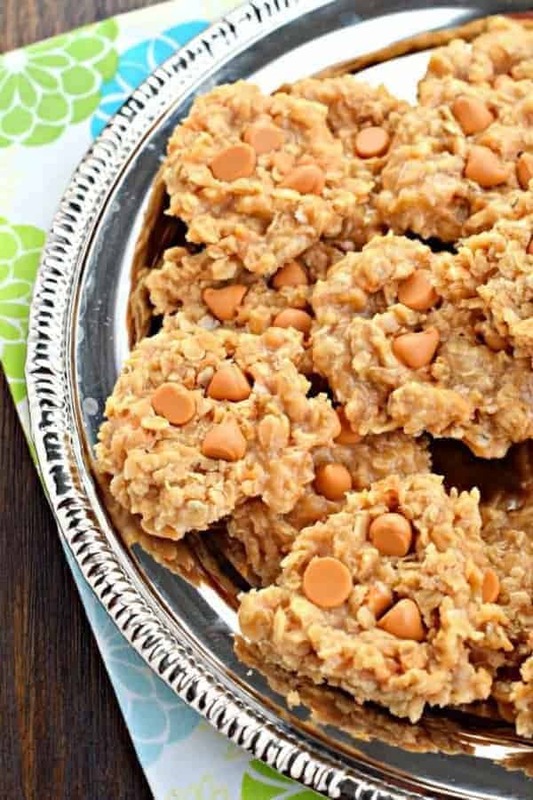 Oh and your butterscotch no bake cookies are a family favorite over at my house!! I make them all the time! These have been my family’s all time favorite cookie for as long as I can remember!! Their so easy and so addicting!! I love to sneak one….or two?….while they are still warm. Now that we are talking about them, I have such a craving for one! 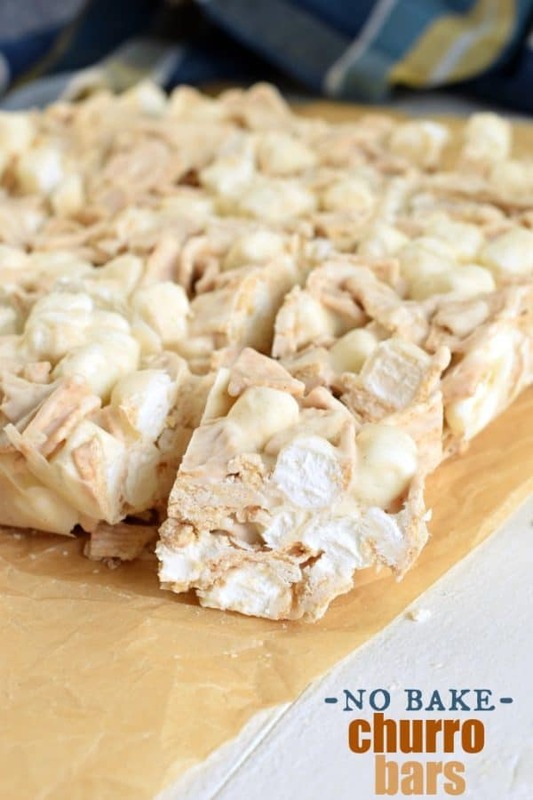 I’ve always loved these no-bake cookies and haven’t had them in years! Thanks for the beautiful reminder. Your cookies look shiny in the picture. Is it because you use regular milk instead of evaporated milk or do you have another secret? My MIL always makes these at Christmas and hers are dull after they set. The ones that I scoop out first are shiny…and by the end of the batch they are dull, LOL. Please stop your recipes from popping on on my home page!! I’m assuming you signed up for notifications (It’s not something I can do or stop on my end). You’ll have to unsubscribe, Sorry! 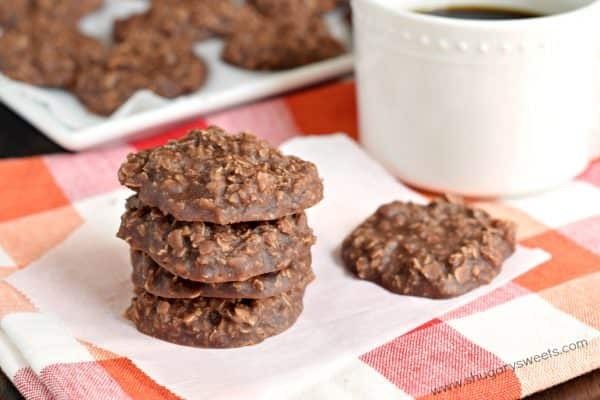 Gotta tell you…these no bakes are called “Preacher Cookies” and here’s why: Many years ago when preachers would visit his members, he would often be invited to stay for a meal. These cookies could be made in just a few minutes and be a perfect dessert to have later after the meal or give him to take with him. Or that’s how the story goes…. in our area (Virginia) they were unheard of until a preacher came to our church from Missouri. The preacher’s wife made them for the youth group (and we LOVED them) and said they were the preacher’s favorite. So, after every mom in the congregation had to get the recipe, we called them Preacher Cookies. Either way, they are always good if they set up! LOL!!! I would love to print this recipe, but unless I have missed it the first six times I have looked, I can’t find it. Is it printable? I find I am more likely to make something if it is printed rather than going back to find a pin. Yes there should be a print option right inside the recipe card. I am saving this recipe to make with my kids! I love no bake cookies! I always like finding no bake cookies recipes. My girls will love these! 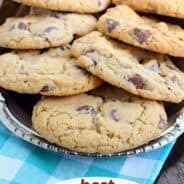 My kids absolutely love these cookies! We are making another batch this weekend! 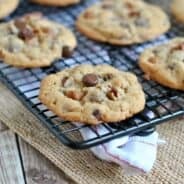 I made up a quick batch of these delightful cookies before my kids came home from school the other day and they were gobbled up in almost no time. Wonderful recipe! I love no bake cookies! I could eat an entire tray myself! These were one of my favorite cookies as a kid – I haven’t had them in years! I can’t wait to make them this weekend! 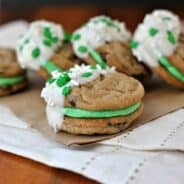 These are far and away my husbands favorite cookies! The recipe is so easy and he just loves them!